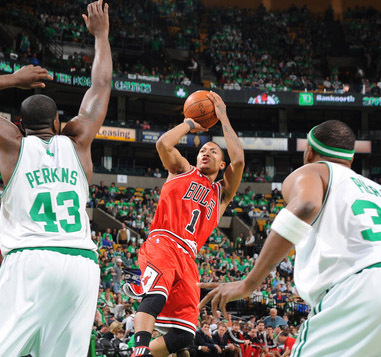 After watching my boy D-Rose torch the Celtics 36pts & 11 dimes, I had to do a quick post on him. Anyone who is surprised by his performance today, never watched his run through the NCAA tournament last year. Derrick Rose likes to play possum during the season, then explode once the postseason hits. I remember waiting all regular season to see why so many draft prognosticators considered him a top 5 pick. Don’t get me wrong, he was always a difference maker, but based on his regular season performances he looked like a player that could evolve into a potential top pick, within a year or two. The same kid, whose diet consisted of gummy bears, twizzlers, and pizza, lost his damn mind in the NCAA tournament. All of his stats improved from the regular season, including his points per game average. Finally I saw the kid from Simeon put on his cape and transform into the blur from Chitown. The same crossover and blazing first step that put the nation’s best point guards on their asses in the tournament, was on display against the Celtics in game one. And just as the case was with Memphis last year, the Bulls will only go as far as Derrick Rose takes them. Good luck homie, and props for a great playoff debut.